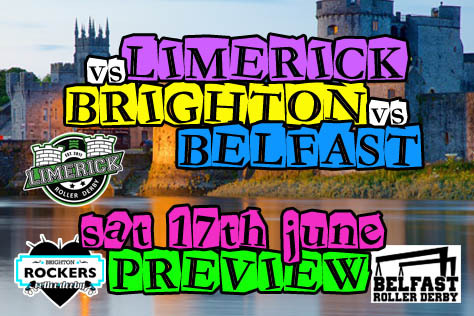 A Munster Calls – The BRIGHTON ROCKERS Face LIMERICK And BELFAST In Ireland This Weekend! The mighty Brighton Rockers A-team are in action this weekend over in Ireland. They will be facing Limerick Roller Derby and Belfast Roller Derby in a three-team mini-tournament at the UL Sport Centre in Limerick tomorrow, Saturday 17th June (doors at 11am). Should you fancy a trip over, Shannon airport is nearby, but this late in the day even the budget airlines are far from budget – expect to pay £300-ish return. The cheapest accommodation option is probably Troy Self-Catering Village, about ten minutes walk from the venue, at around £30 a night. Or for fancier folk, Brennan Court Guesthouse is right next door to the sports centre at £60 a night. The event in Haywards Heath last month saw a big win for the A-team over Hell’s Belles (345-136). What do you recall of that game and the B-team’s narrow loss (187-202) to Suffolk Bees? Both games were very exciting for us and the crowd. The Rockers have been working so hard for the last year and we’re thrilled that it’s paying off. Hell’s Belles were fantastic competitors; they made us push for every point and it was a pleasure to share the track with them. On an even brighter note, the Rockerbillies have been a real inspiration for us. Their determination and spirit shows more and more with every game. Unfortunately this one was a loss, but only by a dozen points, and they were fighting until the very end. I’m so incredibly proud of them. This Saturday (17th June) the A-team are heading over to Ireland for a three team tournament in Limerick. The Rockers’ previous trip to the Emerald Isle (Dublin in 2012) has become the stuff of legend. What are you expecting this time around? Legendary is definitely the right word for that Dublin trip, and our first venture to Limerick will be a great experience for us. We get to play two amazing teams, including Belfast, where the one and only Finn McCruel got her derby start. We’ve got a solid roster of strong, smart players and we may even have a few tricks up our sleeves. It’s going to be a tough back-to-back challenge, but we’re up for it. We’re so excited to experience the wonderful Irish derby hospitality again, and no doubt there will be stories that become the stuff of legends (at least at the after party!). You’ll be facing hosts Limerick Roller Derby and Belfast Roller Derby. Any thoughts re those teams? Are there extra challenges involved in playing two games straight after each other? The rankings are fairly close, and we’ll certainly be keeping that in mind; but we’ll be coming in with our game, and I have confidence that with our teamwork we can make some great things happen. To be honest, I’ve not seen either opponent play. Both games are going to be tough and we always love to learn from new teams – we expect a run for our money! You’re hosting a fundraising night on July 22nd at the Latest Musicbar. What can people expect from that event and what are you raising money for? The event was supposed to be held last week as a fundraiser for our trip to Ireland, but we ran into venue issues and had to reschedule. So now we’re hoping that lots of Rockers supporters will come to help us celebrate and refill the kitty in July, so we can keep doing what we do. We’ve got a fun quiz (hosted by yours truly), great bands and some extra special surprise merch for the night, as well as classic Rockers after party games. It’s going to be SOME night. Finally, do the Rockers have much planned for the remainder of 2017? We’ve got a pretty full summer ahead of us! On Sunday, whilst the A-team are away, the Rockerbillies are raising money skating the South Coast Roll – a whole marathon on skates! Check out the link below to sponsor them. We’ll be taking part in Eastbourne Extreme in July, skating Proudly in the Brighton Pride parade in August, and arranging some incredible games for the autumn. There’s so much to look forward to! This entry was tagged Belfast Roller Derby, Brighton Rockers Roller Derby, Limerick Roller Derby, roller derby, roller skating, sport, women's sport.